If the household is located on the shores of birchor river, the big problems with the water supply does not occur. Much more difficult things, when the site is far from natural water sources. It remains to extract water from the ground, but it needs to find natural resources that would be clean, suitable for drinking. The choice between the well drilling and pressing of the button of the well site owners do, based on the characteristics of the terrain. If the aquifer is deeper than the level of 15 meters, the forthcoming completion of wells should be left to professionals, and if Vodicka is closer to the surface, then read this article about how to dig a well with their hands. Perhaps, the process does not seem too difficult. Make a well on their own is not as difficult asIt seems to work although it is necessary fairly. It is important in the process of work to comply with the rules relating to the wells of the device. Of course, no one will check, did you do all that is necessary or treated to work formally. But you are doing well for themselves and their family members, so must themselves be interested in the fact that the resulting water was fresh and clean. No grandfather's methods do not give a clearanswer to the question whether there is water in your area, and if it still exists, what is its quality. Exploration area - the only reliable source of such information. If the capital structure on a site already exists, then the survey data are available. Otherwise, we can only meet with the nearest neighbors, whose wells are already in place. Ask them what is the depth of their mines, have water samples. Let the local SES will check the water quality. By the choice of location for the well should be also approached with the utmost responsibility. Geological situation in your area. 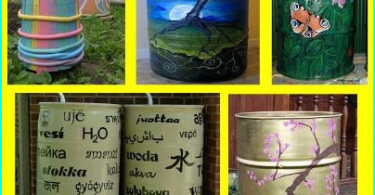 For example, if the neighborhoods are swamped, the well will be able to not dig drinking water because "perched", which will inevitably be in the underground source, will bring all the dirt on the surface. Availability near significant sourcescontamination. For many pollutants surface waterproof layer is not an obstacle. They penetrate into the groundwater and poison them, making unfit for consumption. The characteristics of the soil and terrain. The most difficult thing to cope with work on rocky terrain. It is problematic to do well and on the mountainside. It is best suited for well flat terrain. Distance to the place of consumption. On the one hand, well I want to place closer to home to avoid the construction of extended communications, through which water will flow into the house. 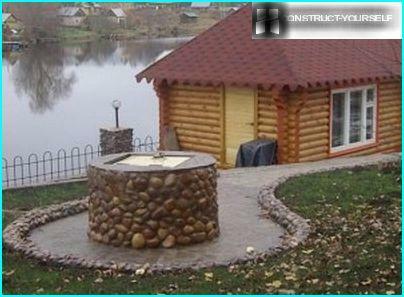 On the other hand, within 5 meters from the buildings of the well can not be placed. This proximity may adversely affect the foundation of the building. 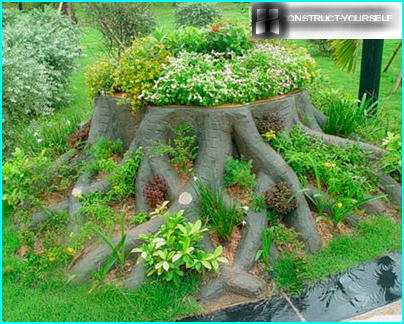 The accumulated water can wash away the ground under the building, partially destroy the "sole". Eliminate such consequences are not so simple. There is one more restriction, according towhich is around the well in the 50-m buffer zone should not be placed drains, sewers or landfills. Otherwise, produced water will be useless to you the specifics. 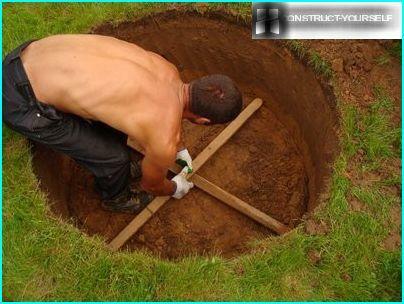 To learn how to properly dig a well,one must first deal with what the art of digging even exist. 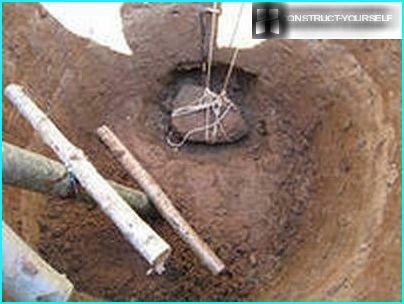 Professionals practice indoor and outdoor way of digging wells. Since the differences in these techniques are fundamental, each of which deserves special consideration. 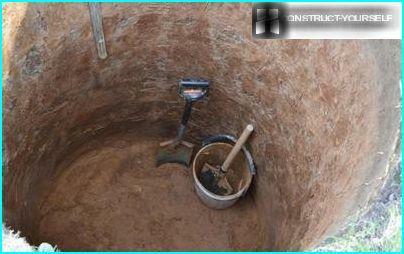 Manual installation of water-bearing structures in the area with a dense ground made open way. joints between each pair of rings carefully sealed with a special sealing compound. If the composition of loose soil (gravel or sand), theperform work open method problematic. The walls of the mine will inevitably move, crumble, etc. The work will have to interrupt the process drags on, will become prohibitively labor-intensive. We'll have to dig a well closed in a manner that specialists in another is called "in the ring." It is necessary to mark the place of the well location,the diameter of which corresponds to the outer diameter w / w of the ring, and remove the top layer of the earth. Delve need as much allow the soil. 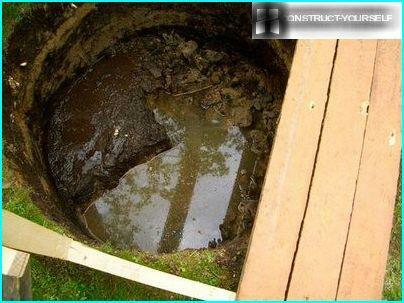 Typically, the well depth is between 20 cm to 2 meters. It formed a pit inside which is placed the first ring. Further work will take place inside the ring, and subsequently formed the reinforced concrete structure. Ring under its own weight falls lower and lower, and the next ring placed on top, increases the weight of the structure and is installed with the previous. After reaching digger aquifer wells installed last ring. He was not completely buried. Insulation and sealing of joints between the rings is carried out exactly the same way and in the open, and with the closed method. At the final stage is mounted everything necessary for the well functioning of the equipment. Outdoor attractive method, particularly,its simplicity. Dig much more convenient not surrounded by concrete. However, there are advantages and disadvantages of each way of digging. Often when driving you can find a boulder. If this happened during the sinking of the open, the shaft is easy to expand, obkopat obstacle and pull it to the surface, tying ropes. Now imagine how much the problem is complicated when the excavator is in the closed space of the ring. The problem may be insoluble. Another trouble that can happen inDuring operation, a quicksand. Quicksand is called soil saturated with water, which can be spread. Being in an open mine, digger may attempt to stop the quicksand made of grooved boards elementary caisson. You can then falling asleep ground space between concrete structures and mine, to completely isolate the quicksand. Have closed penetration is another minus. It occurs when the "perched" appears in the mine. 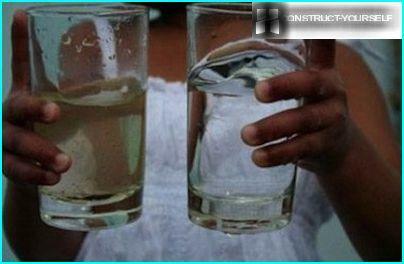 It goes down along with adjustable rings, and then mixed with groundwater, and corrupts them. Contaminated well nobody needs. Moreover, it turns out that to get rid of, in this case from the "vadose" is very problematic. You can dig another hole on the outer surface of the rings to reveal the source of the "perched". But to identify and isolate it, even in this case does not always succeed. 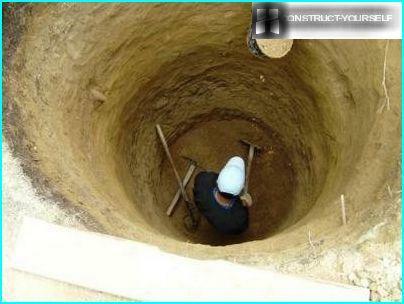 It would seem that doubts disappeared, and we know how to dig a well in the country. Indeed, the open method of merits are obvious, and now turn to its shortcomings. In the open method of digging the mine has to diglarger diameter than the well being built. The natural solidity of the ground inevitably violated. Between the walls of the pit design and mine, we put the soil, which is different in structure and density of the original is here. New primer may be subjected to deformation, and rings - offset relative to each other. Such motions can cause the destruction of the well. Furthermore, in the open method is muchincreasing the volume of excavation. And more: it is necessary to acquire special equipment to install the reinforced concrete rings. 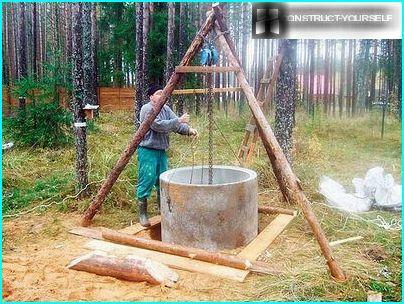 Need rope, hook block and winch tripod. The process of lowering the rings are not only complex, but also a dangerous occupation. When using a crane to properly install and combine the rings will be easier, but it is always involvement of specialized equipment is expensive. If inexperienced digger underestimated the degree ofsoil density, mine walls may crumble, bringing to naught all the efforts. If the mine stood in finished form without races over three days, the likelihood of its collapse increases substantially. Naturally, when digging "in the ring" this danger does not threaten. When under its own weight of the ring immersed in the mine, ground integrity is practically not disturbed. To install them do not need additional hardware, and reduces the probability of getting injured. 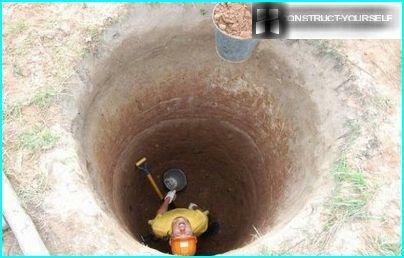 One can not dig a well. It's not even the fact that it is physically hard. There is another kind of danger. Nedra land rich in surprises. In addition to water supplies, you can stumble upon an underground gas accumulation. It can be fatal in a limited space of the mine. Identify the invisible hazard can be using a burning torch. Quickly extinguished the fire talking about unacceptable gassed. Falling cargo digger on his head - another obvious danger. Do I need in such a situation to talk about the relevance of the use of protective helmets? Therefore, a well-organized digging wellsIt implies not heroic work of lone enthusiasts and well-planned work of the group of like-minded. For example, they organize forced ventilation shaft, using for this purpose even if fans and vacuum cleaners. Alternately mine and dig together to set the ring easier, and to celebrate the solemn commissioning much more fun with friends.